Conor (56) joined the airline industry just 40 years ago as an Aircraft Avionics Apprentice with Aer Lingus. He spent 18 years with Aer Lingus (now part of IAG) and is a contemporary of Qantas CEO (Alan Joyce) and CEO of IAG (Willie Walsh). Winning an Engineering Scholarship he graduated from Trinity College Dublin in 1986 and returned to Aer Lingus working in route planning, marketing, finance and management information. He was appointed Chief Executive of Aer Lingus Commuter at the age of 28. 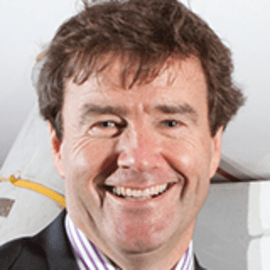 As GM-Strategy Conor was instrumental in the hugely successful turnaround of the Aer Lingus Transatlantic Operation with the negotiation, specification and successful introduction of the Airbus A330 in the mid-90s that prevails today. In 1996, Conor was hired by Michael O’Leary as Director of Group Operations for Ryanair from 1996 to 2000. During this time Europe’s largest LCC trebled in size, saw unit costs drop by 25%, rolled out its first Continental ‘Bases’ and introduced the new Boeing 737-800. Conor was responsible for Safety, the famous Ryanair 25-minute turnaround, new Base rollout and specification/introduction of the new fleet of Boeing 737-800s. In 2001 Conor established the aviation consultancy company, PlaneConsult. Over the past 18 years PlaneConsult has worked in every Continent and 24 countries with many clients including easyJet, Aer Lingus,  Air Asia, Qantas, Jetstar, Air Deccan, Pegasus, Alaska Airlines, Copa, Thai AirAsia, AirAsia X, MAS, flyNAS, Saudia and vivaAerobus. During 2006 PlaneConsult, Irelandia and Mexico’s largest coach operator, IAMSA, established a new LCC, vivaAerobus, which currently operates 20 aircraft and is a vibrant, profitable and growing force within Mexican aviation. Conor remains a shareholder and advisor to vivaAerobus and through PlaneConsult, led their negotiations and successful order for 92 new aircraft and all associated fitout. Conor is a co-founder, shareholder and former director of AirAsia and its affiliates in Thailand, Indonesia, Philippines, Japan and India. Alongside Tony Fernandes, Conor managed aircraft, engine, fit-out and maintenance negotiations for AirAsia orders including over 525 existing A320, A330 and new A320 NEO aircraft. In 2009 Conor established Dublin Aerospace on the site of the old SR Technics facility following its collapse and the loss of 1,000 jobs. With a unique profit-sharing and employment model in the Aircraft, APU and Landing Systems Overhaul sector, this Irish MRO competes successfully with the Middle East/Far Eastern/Chinese MROs. The enterprise reached profitability after 12 months in operation and has grown its profits annually since with revenue by 7x to almost €50M in just 8 years. Conor is Executive Chairman and majority shareholder of Dublin Aerospace. Following on the successful launch and growth of Dublin Aerospace, Conor won the 2011 Ernst & Young Irish Entrepreneur of the Year (Emerging Category). Conor served as NED on the Board of Pegasus Airlines (2012-2016) during its rapid growth phase and huge order for new A320neo Aircraft. He is non-executive Chairman of Stobart Air who operate the Aer Lingus Regional franchise in Ireland and also for other airlines in the UK.